Last fall, Davis Brown debuted his Symphony No. 1 with the Salisbury Symphony in a concert at St. John’s. 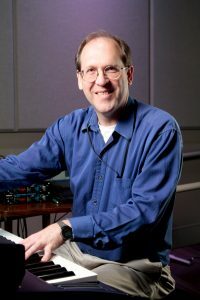 This month, Davis — who’s been a composer for more than 40 years — will present a concert of original contemporary Christian music. The free event will take place in the Faith Center on Saturday, March 17, beginning at 3 pm. Along with Davis, other featured performers include Bradley Chestnut on guitar and vocals, Ondria Witt on vocals, Kevin Agner on cello, and Sacha Witt on trombone. Davis first performed at St. John’s on solo piano. As a result, Rob Durocher, minister of music, asked him to give a piano concert. But since Davis was teaching out of town, he had no time to prepare. Since he lives in Salisbury full-time now, he’s been a part of the praise band for the 9:27 service. Rob’s invitation was still open, so Davis decided to plan a concert. Davis says that his songwriting comes from the perspective of telling a story. As he develops songs, he thinks about working through a crisis or another situation — and looking for spiritual guidance and strength to cope.